What Is Tracheal Deviation and How Can It Be Treated? Home » General Health » What Is Tracheal Deviation and How Can It Be Treated? The trachea is a fairly important part of the body. It’s the windpipe. It connects your larynx to the two main bronchi. Without it, you wouldn’t be able to speak or breathe for that matter. It may be one of many components of your throat, but you definitely need it. So, what if the trachea isn’t sitting quite right, and you’ve suffered from a tracheal shift? That’s called tracheal deviation, and in this article, we will take a look at everything you may be curious to know about tracheal deviation. From tracheal deviation causes, to tracheal deviation symptoms, to tracheal deviation treatment, here’s your official guide to the interesting ailment. This is an enlargement of the thyroid gland or the positioning of a portion of your thyroid gland behind your sternum. Both things can cause your trachea to shift. Tumors, both benign and malignant, in your bronchi, pleural cavity, or lungs can cause a tracheal deviation. The lining of the inside of your chest cavity is called the pleura. It can thicken as a result of chronic inflammation and become calcified. A pleural effusion happens when there is an accumulation of fluid between your lungs and the chest wall, which can move the trachea. This surgery to remove all or part of a lung can cause the trachea to shift as a result. 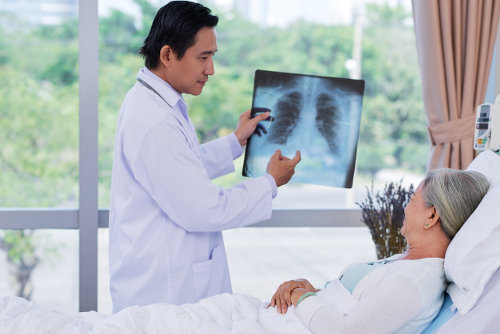 Atelectasis is the medical term for a complete or partially collapsed lung. It occurs when the lung’s air sacs become deflated. When you have an injury to your lungs, they may collapse due to a large volume of air entering the space between your lungs and chest wall. This small space is called the pleural space, and the excess air can restrict how much air your lungs can take in. This is the absence of your lung and/or the bronchus brought on by a congenital abnormality. Both lymphoma and lung cancers can cause the trachea to shift. Those are the causes of tracheal deviation, but what are the symptoms? What does it actually feel like? Tracheal deviation has multiple symptoms that can be divvied up into a few categories, as the deviation may affect different areas of the body. Those categories are respiratory, cardiac, and other. Other symptoms may include severe coughing, anxiety, and fatigue. Luckily, once you recognize these symptoms, you can head to a doctor for a full diagnosis and, hopefully, a quick route to treatment. You think you’ve got tracheal deviation, but you aren’t sure. You go to a doctor—how does the doctor go about diagnosing you? The doctor will go through your recent medical history, looking for the symptoms that we described in the previous section. If the doctor suspects you may be suffering from tracheal deviation, then you will probably have an X-ray to confirm the diagnosis. Once the diagnosis is confirmed, the doctor will begin to explore treatment options. Treatments may depend on the overall cause of the tracheal deviation. Once this is identified and treated, the tracheal deviation may correct itself. The key with tracheal deviation is not to let it go undiagnosed for too long. Essentially, it is not so much a problem to be dealt with as it is a symptom of a much bigger problem to deal with. While the tracheal deviation may be causing some issues, left untreated, a tumor can cause a great many more issues that are direr in nature. Get it checked out, get the underlying cause fixed and then everything will be good. “Tracheal Deviation,” Healthool; http://healthool.com/tracheal-deviation/, last accessed May 12, 2017. “Tracheal Deviation,” Healthy Life Med, May 17, 2015; http://healthylifemed.com/tracheal-deviation/, last accessed May 12, 2017.